No longer confined to sociology, history, political science, law and the like, Marxism (or "Critical Theory") has invaded university accounting departments. 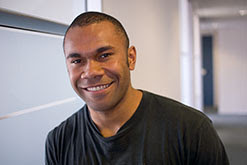 My latest Socialist Academic Profile looks at "critical accountant", Pala Moisa, a lecturer in Victoria University's Accounting Department. The son of the late leftist Vanuatuan politician/activist, Grace Molisa, young Pala Molisa has been hanging around Victoria university for the last few years. He's been active in the radical dominated Post Graduate Student's Association alongside the likes of Alistair Shaw and Graeme Whimp. Molisa's teaching interests are in the areas of critical accounting, sustainability accounting, management accounting and financial accounting. Pala is a FRST (Foundation for Research Science and Technology) funded researcher in the area of sustainability assessment using social accounting technologies. Pala's research interests include examining the relationships between accounting and society drawing on literatures from critical theory, sustainability, and accountability. He regularly attends gatherings and conferences where he delivers fascinating papers like "Accounting Harmony, Neo-Gramscian Discord: A New Zealand Perspective"
Check out this gem from Molisa's 2005 paper "Towards a Critical Accountability for Social and Environmental Accounting". To aid in my exposition I draw on two theorists who have written extensively on consciousness and the role of education in social transformation: Karl Marx and Paulo Freire. I use Marx for his revolutionary theory of consciousness, which provides us with historical and materialistexplanations for how consciousness arises. His theory of consciousness provides us with valuable heuristics for informing and critiquing accounting engagements and interventions. Freire is used because he extends Marx's theory of consciousness by directly addressing the role of learning and communication in making consciousness more critical. Although known primarily as an educator, Freire also makes original contributions to socialist revolutionary strategy and thus offers a rich set of insights on how transformation can be pursued whilst we are caught within capitalist social relations. I also deploy them to evaluate some of the accountability frameworks that are being developed in the social accounting literature by assessing how they approach consciousness and the educational characteristics that they have. This conversation should be taking place in light of recent accountability research that suggests that much of social accounting theory and practice, rooted as it is in the liberal democratic tradition and the logic of reformism remains incapable of transcending capital’s social universe or the concomitant instrumentalism and violence that this social system engenders.. This paper then draws on Marx, who offers perhaps the most comprehensive explanation of capitalism's essential structure and dynamic tendencies offers resources for theorising the abolition of capital itself. I use Freire because he offers a strategic approach to social change that recognises the pervasiveness of relations of oppression and exploitation. His educational approach to social transformation utilises learning opportunities as pre-figurative struggles to prepare people for revolution, thus working through, in and against antagonistic social forms. His educational approach is useful in informing our critical and social accounting engagements, for example, with organisational representatives (i.e. managers) or stakeholders. This paper then hopes to open up some space where we can begin to imagine a world outside of capitalist social relations and also to strategise how accounting could be used to get us there. And you thought accountants were boring! Activist Accountants! Bolshevik beancounters! Marxist money manipulators! Imagine if these idiots got into Treasury? Wow I was under the illusion accounting is boring! This guy makes it sound awesome. Never realised there were radical accountants around. Should get in touch with them because they would be very useful for the movement. I knew you'd be pleased Cameron. Stupid me! And I always thought accounting was adding up columns of figures to provide a snapshot of the fiscal well-being of a country or organisation! What a f*cking little berk this man is!!!!!!!! A coconut (or about 50 million of them) must have dropped on his head when he was a kid in Vanuatu. You are an ignorant, racist, coward. I am not surprised you are too scared to identify yourself, I wouldn't want people to know who I was either if I were you.